Lionel Messi doesn’t need to prove his greatness, football must address its concussion problem and more. 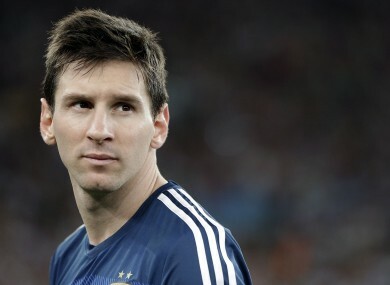 Messi was criticised by some despite winning the Golden Ball. IT’S BEEN ALMOST a week now since the end of the World Cup. Consequently, after much reflection, we’ve assessed some of the major themes and talking points likely to be taken from the past month of football and tried to make sense of what can be inferred as a result. Hence, below are six conclusions we’ve reached from the recent frenetic festival of football in Brazil. Last November, Tottenham controversially allowed goalkeeper Hugo Lloris to continue playing despite temporarily losing consciousness following a collision with then-Everton loan striker Romelu Lukaku. The club’s actions caused considerable uproar, with brain injury charity Headway claiming Spurs were guilty of an “irresponsible and cavalier attitude”. Many critics consequently hoped that this incident would prove a turning point, and that football would finally realise the dangers of concussion-based injuries, as other sports are gradually beginning to do. Nevertheless, over six months have passed since then, and the sport still seemingly hasn’t made any substantial changes to protect its athletes. This lax attitude was accordingly highlighted on more than one occasion over the past month — blows to the head suffered by Urguguay’s Egidio Arévalo against England and Javier Mascherano of Argentina in their semi-final with Holland being two prime examples, with authorities on both occasions making only token attempts to convince the players in question to leave the field, before meekly allowing them continue upon the merest hint of protest on the athlete’s part. Of course, players will nearly always insist on continuing in such circumstances, so FIFA must ensure the decision is taken out of their hands or serious harm could be caused in the long term. Football has changed irrevocably in recent years, yet its officiating has failed to follow suit and remains in the dark ages as a result. Barely a fixture went by at this World Cup without at least one extremely contentious call altering the course of the game. In the first match alone, Brazil’s Fred was awarded a very soft penalty, while Neymar was all too leniently let away with a booking when he clearly elbowed an opponent. Midway through the competition, there was the initial ignorance of Luis Suarez’s biting despite the vehement protests of his victim Giorgio Chiellini. Had this incident been seen, then it surely would have resulted in a red card as well as Uruguay — rather than Italy — departing the competition at the group stages. And even the final, which was generally well officiated, was hampered by the referee being too intent on refraining from sending players off, despite Mascherano and Bastian Schweinsteiger both being deserving recipients of a second yellow at various points. If these mistakes were sporadic, then they could simply be put down to individual referees’ incompetence, yet their continuing regularity suggests football games have become practically impossible to govern without outside help. Players are more dishonest than ever, while the sport has also become increasingly fast-paced in modern times, and an introduction of technology — with each manager getting three challenges á la players in tennis — would surely at least lessen the frequency of such problems. Spain’s premature exit led many critics to proclaim that their patented tiki-taka style, which had brought them unprecedented success, was now dead. Many people consequently suggested that the more pragmatic brand of play favoured by their conquerors Chile, among others, was the way forward in footballing terms. Nonetheless, these assumptions were undermined by the tendency of the eventual winners, Germany, to play a system that, while not identical, was certainly influenced by Spain’s past successes. Granted, there were some stark differences too — they played in a more direct fashion and weren’t quite so obsessed with keeping the ball — one of the more intriguing statistics from the now-infamous semi-final game was that Brazil actually had similar levels of possession compared with their opponents. However, Germany’s emphasis on creative players in midfield, their high line and in particular, their intensive pressing all had a distinctly Spanish feel. And like Spain, their superior talent meant most sides played with ultra-caution against them, resulting in some slender victories, whereas on the rare occasions when teams were less defensively set up (for Portugal and Brazil at this competition, read Italy in the final at Euro 2012), they were invariably taken apart with ruthless precision. Prior to this World Cup, many experts picked a South American team as their prediction to win the tournament on the basis that European sides supposedly ‘never’ do well in South America owing to their lack of familiarity with its climate. And granted, the statistics previously supported this assertion — of the four tournaments previously hosted by South America, each had been won by a country from the continent. However, this cannot be considered a major factor in an era when conditioning and sports science is more sophisticated and advanced than ever. While South American teams generally performed with distinction this year, their European counterparts hardly struggled by comparison — as well as Germany triumphing, sides from Europe were still more prominent than any other team in the last 16 and comprised of exactly half the quarter-finalists. Many commentators who witnessed the capitulation of Brazil in the semi-finals typically came to some very excitable conclusions. So does the fact that this flawed Brazilian team reached as far as the last four constitute proof that international football is in terminal decline, as some have implied? Not necessarily. While this World Cup has, of course, not exactly been overloaded with incomparably brilliant sides, are the Brazilians of 2014 considerably worse than the South Koreans of 2002, who managed to emulate their feat of getting to the last four? Or the Uruguayans of 2010 for that matter? Or take the 1994 World Cup — was that Brazilian side who ultimately triumphed any better than the Germans are now? Their opponents in the final, Italy, certainly have some uncanny similarities to the modern-day Argentina, given that they were a limited enough side inspired by one superstar who was struggling for fitness (Roberto Baggio). While the World Cup has surely been superseded by the Champions League as the trophy every player wants to win, this does not mean international football has suddenly become an afterthought by contrast. Those who insist otherwise lack concrete evidence to back up their claims, as in truth, the World Cup — whether it’s 1958 or 2014 — has always more or less been a mixture of the odd great side competing against a number of hard-working, well-organised teams with few star players, who have punched above their weight considerably by progressing to the latter stages. Lionel Messi has endured some criticism following his failure to add the World Cup to his practically endless list of accolades, yet to suggest he needed to win the tournament with Argentina to prove his greatness was beyond ludicrous. Granted, he was below par in both the semi-final and final, but he was still Argentina’s single most important player, without whom they simply would never have gotten as far as they did. Even when barely fit, and clearly suffering the effects of wear and tear, ostensibly owing to his relentless schedule of recent years, he still managed to score more goals than the rest of the Argentina team combined. The Barca star’s dramatic interventions made the difference in games against Iran, Nigeria and Bosnia, and without Messi’s influence, it’s doubtful if the Argentines would have even made it past the group stage. Although the 27-year-old may not have deserved to win the Golden Boot, he also didn’t deserve the vitriol that came his way following an underwhelming performance in the final, and he certainly doesn’t deserve to be dismissed on the basis of one or two disappointing outings, no matter how grand the stage on which he falters. Email “6 lessons learned from the 2014 World Cup”. Feedback on “6 lessons learned from the 2014 World Cup”.